Looking for a Loft Conversion? Lee Charles Building Contractors is a well-established company working all over London, Essex & Kent and all other surrounding areas. Our construction projects include Loft Conversions Single & Double Storey Extensions, and all Domestic and Commercial Building work. We also specialise in Kitchen and Bathroom Installations with all work carried out to the highest standards. We can work on your project from concept to completion including Architectural Plans to obtain planning permission. Having completed many successful projects, we have the experience and the expertise needed to realise the construction or renovation project of your dreams. We can also advise on alternative solutions that could be less costly and take less time to complete without compromising quality. Are you considering a Loft Conversion?? A Loft Conversion or renovation can prove to be a cost effective way to extend your home, create much needed space and increase your property value. If you plan to extend in the future, but don’t have the resources for a full extension then a loft conversion or attic renovation may well prove a more economical solution. Loft Conversions are often great spaces to transform into living areas, with games rooms and extra bedrooms being the favourite choice. Loft Conversions don’t have to be complicated when it comes to the finish article. This particular project has laminated flooring in a light colour which is contrasted with the door and velux frame colour. The 2nd fixing of skirtings and architraves are finished in a gloss white and the emulsioning of walls and ceiling are also white in appearance. Although the colourisation is pretty basic it still has a certain definition and simplicity about it. Even the Loft Conversion entrance can have a striking finish when using the right timber for your spindles,hand rails etc. Most Loft Conversions provide an additional bedroom space to any property. 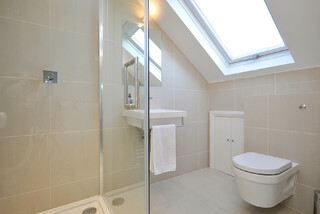 This sometimes is complimented by having an En-suite bathroom included dependant on loft structure. When it comes to building Loft Conversions the most used material is Timber. Over 90% all Loft Conversions are made out of timber, the rest of the materials used consist of steel, roofing materials, and Insulation. Typical En-suite within a Loft Conversion. We supply and fit new designer bathrooms exactly to your requirements. All projects carried out include electrical installations, plumbing and tiling work and all fittings. All products used and installed by Lee Charles Building are quality products. Bathroom installations include some of the finest bathrooms suites available. You can choose your bathroom suite and wares from any of our supplier’s or choose your own and we will provide just the labour for fitting.